This article has appeared in several versions; a long feature version appeared in the BIRMINGHAM POST (SUNDAY MERCURY) focused almost entirely on ‘Paddy’ Ryan and his links to Warwick and the British military. Briefer versions also appeared in two northeast regional papers; the front page of the Darlington & Stockton Times, and ‘The Northern Echo’. An Irish version has been posted on the website www.writing.ie ‘The home of Irish writing online’) titled ‘Secret lives and the children of independence’ (click HERE to read it). Most of us have secrets of one kind or another, and some of us have secret lives…‘The characters who inspired ‘Crossing the Water’ all had quite remarkable secret lives; from the heroic and darkly comic to the tragic and shameful, often co-existing within the same complex character. 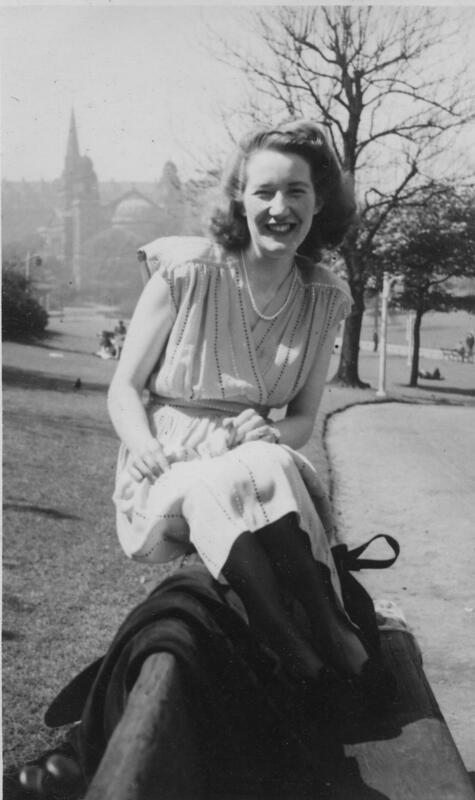 My mother (pictured in 1946) had a few secrets that she revealed only in later life. She had met a County Cork man known as Pat, a handsome merchant navy engineer on the Atlantic convoys, while serving beer in her father’s pub in Weardale during world war two. At that time, the merchant navy men were the unsung heroes who literally fed everyone in the country and provided the weapons to fight on. They suffered terrible losses; it was a far more dangerous role than being in the armed forces. Pat himself was sunk by U-boats twice but somehow survived each time; he was also a very talented singer, who had once sung the lead part at the New York Metropolitan opera house – and he had the publicity photos to prove it. Meanwhile, her father was a different kind of hero – a family man who not only stayed loyal to a wife whose mental health went gradually but very, very steeply downhill, but somehow managed to keep her at home while raising their six daughters almost single-handed. He managed this by running several small businesses (including that pub, plus a post office) throughout the thirties and forties in the villages of upper Weardale. Those daughters grew up to become loving and generous aunts to my generation, but the shame of their mother’s mental illness left a veil of secrecy over their childhoods, added to by darker secrets when one of the sisters died in tragic and mysterious circumstances. Only in their later years could they talk about these events. 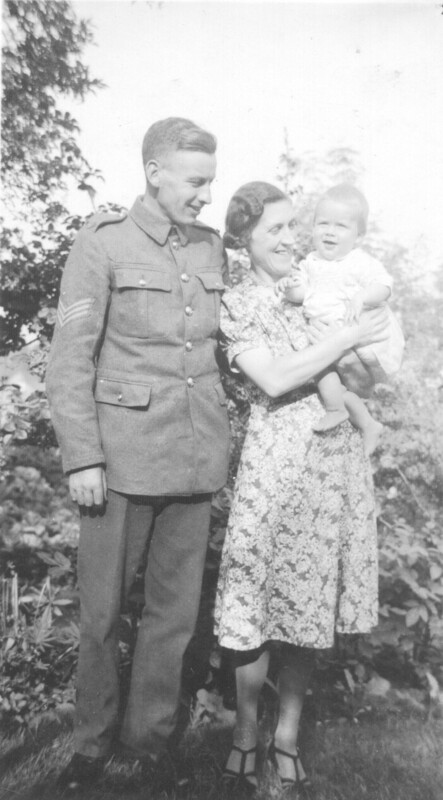 Perhaps the most unusual secret life belonged to my father in law, Frank ‘Paddy’ Ryan (shown with his wife and baby son). He was another County Cork man, brought up in difficult circumstances; as a child he was passed between various relatives and friends. Like many of the children of independence, he was forced to emigrate to find work. He crossed the water as a young man and joined the Royal Warwickshire regiment in the 1930’s, married a girl from a Wensleydale family, and became one of the ‘Fighting Irish’ throughout World War Two. His regiment went to France in 1940 and fought as part of the rear guard at the Battle of Dunkirk, delaying the Germans while other troops were evacuated. Because Paddy was a crack shot with the rifle and mortar he spent the rest of his war training new recruits back in England, ending up as a Staff Sergeant. 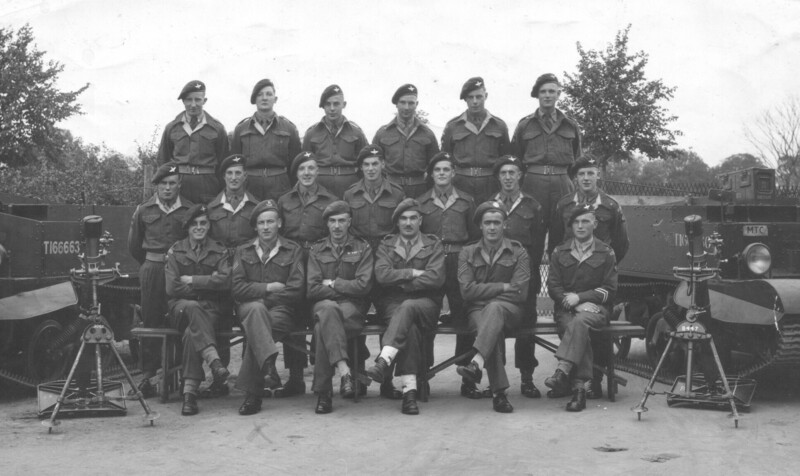 The picture below shows him (front, second from left) with a mortar section from the parachute regiment. One of his secrets was that as a small boy he met Michael Collins (the IRA commander who won the war of independence) at a secret meeting in his uncle’s pub. Collins was probably recruiting for the Easter rising; Paddy was hiding under a table at the time; as Paddy described it, “I only really met his boots. They called him ‘the big feller’, and he had big boots all right. That’s what I remember, his big boots.” Later as a boy of nine, he was caught in the middle of a cross-fire between the IRA and the British army. “I got shoved to the floor by a British soldier. And then the shooting started… and the feller who pushed me to the floor, he took a bullet and fell on top of me.” That soldier probably saved his life, and inspired Paddy to join the British army. Meanwhile, my father was spending his war years in north-west India (now Pakistan, near the Afghan border) where he found himself bridging two worlds; that of the old-fashioned Raj and the new India-to-be. In Peshawar, he became close friends with an Indian signals officer (Captain Ananda Mehra, known as ‘Andy’). When he returned from a visit to the Mehra family home, he found himself ‘sent to Coventry’ by the other British officers and soldiers, such was the disapproval of inter-racial friendships at that time. I’m proud to say this did not deter their friendship, or inhibit my father’s love of curries from the bazaar. 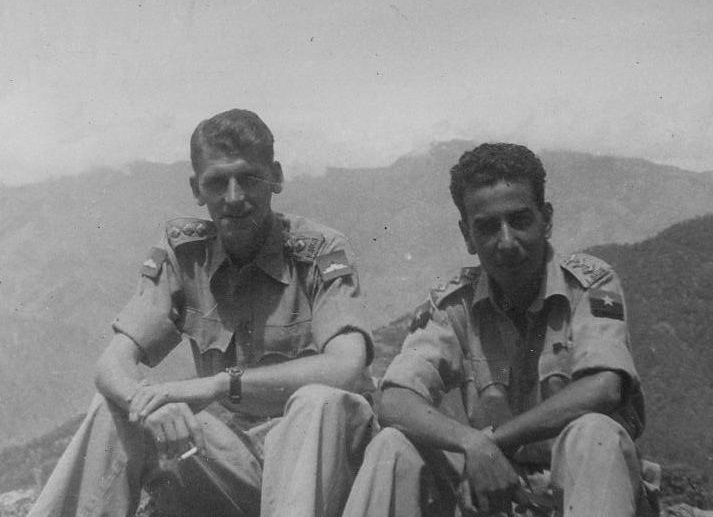 The army solved the problem by letting him work with Indian and Gurkha regiments, and he amassed a wonderful archive of black and white photographs. 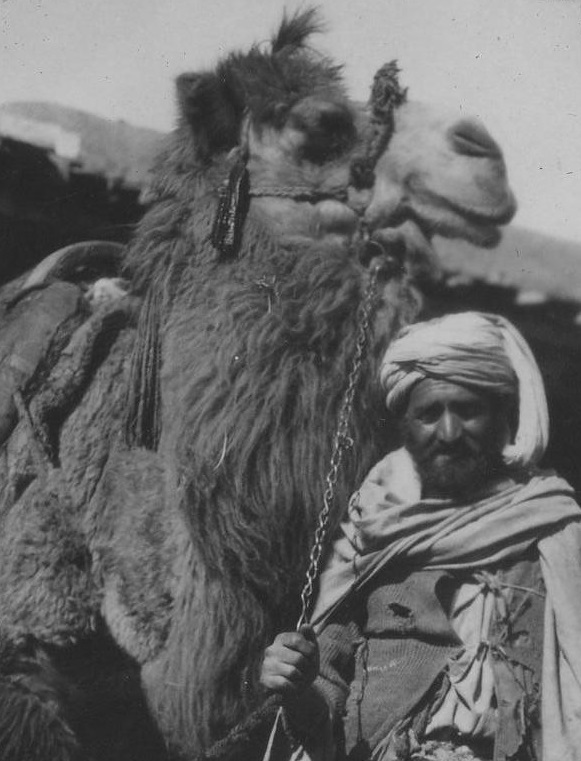 The camel trader was taken in 1944 when he acquired some Persian and Afghan carpets from merchants coming over the Khyber pass. He packed the carpets up in a trunk and sent them home, part of a consignment due to travel on a certain ship. Unfortunately, he soon heard that this particular ship had been sunk by a Japanese submarine! He didn’t buy any more carpets after that. But much to his surprise, after he’d been home 18 months the trunk and the carpets turned up, undamaged… better late, than never! 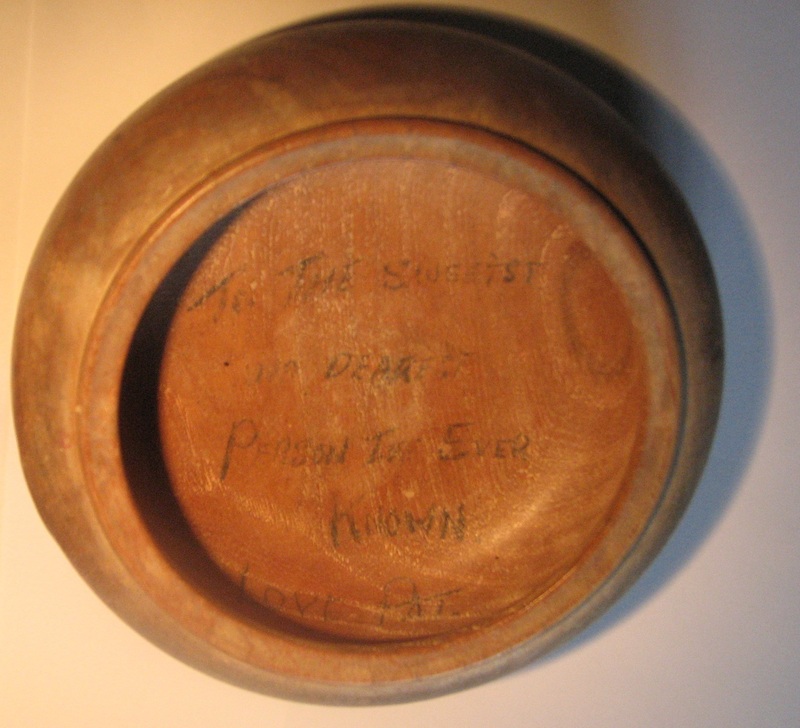 Like many overseas soldiers he received a dreaded ‘Dear John’ letter, breaking off his engagement to a girl back home. 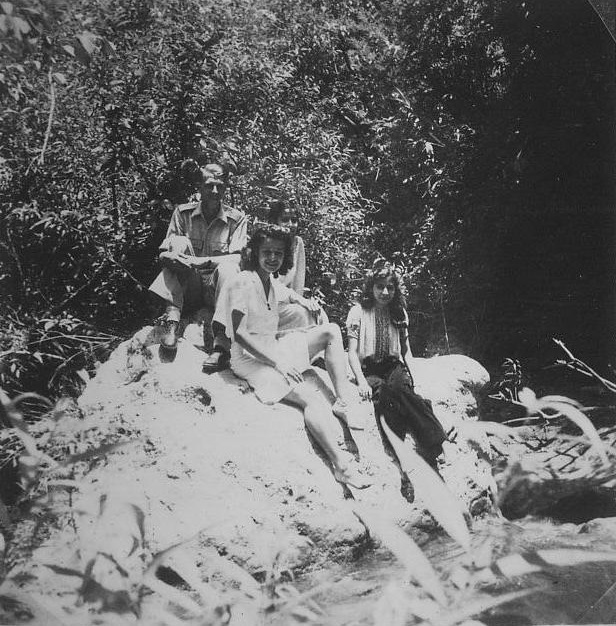 But he soon learned to enjoy being a bachelor in India, a number of photos of him with various pretty girls demonstrate…the one here shows him with a very attractive Anglo-Indian girl and her sister, by a waterfall. After the war, he became a very respectable and respected headmaster at a northeast comprehensive school; few people knew about his secret life in India during the war. The novel ‘Crossing the Water’ was inspired by these secret lives. It begins in Ireland, with that shoot out on the bridge and two boys caught in the middle… and then gradually becomes an Anglo-Irish saga and romance set in a remote corner of the north-east… and since about ten per cent of the English have an Irish grandparent, that’s not so unusual.